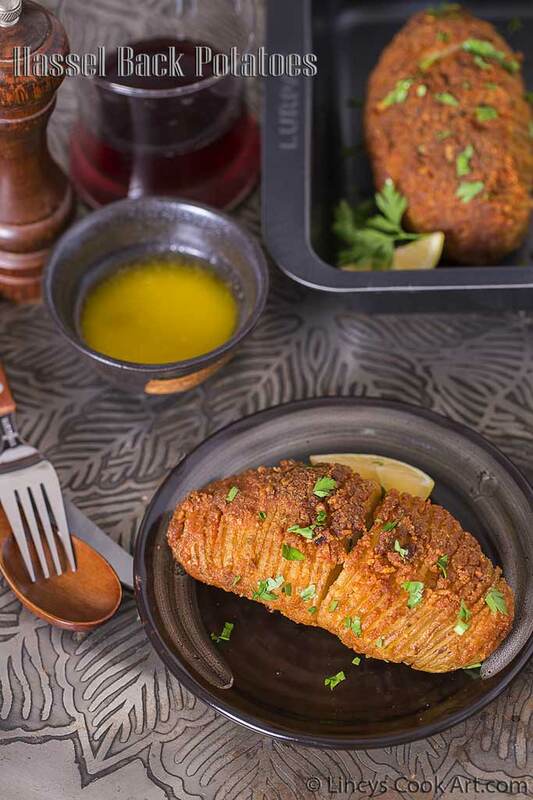 Hasselback Potatoes are nothing but baked potatoes of the Swedish version. These baked potato fans were popularized as the namesake dish of the restaurant at the Hasselbacken Hotel in Stockholm, Sweden. It was in my to do list and i was waiting to try my hands in this dish. I decided to make this potatoes for the T20 cricket match finals. Once the cricket match was over and India lost the cup we made up the day with this yummy baked potatoes and the roasted tandoori chicken. I love the crispy flavourful top parmesan cumb crust and also the bottom crust of the potato skin. It is definitely a treat for eyes as well as for potato lovers! These delicious potatoes are as comfortable at a family dinner as it would be at a dinner party. They are as beautiful as they are wonderful to eat. Definitely a unique and delicious way to serve potatoes! 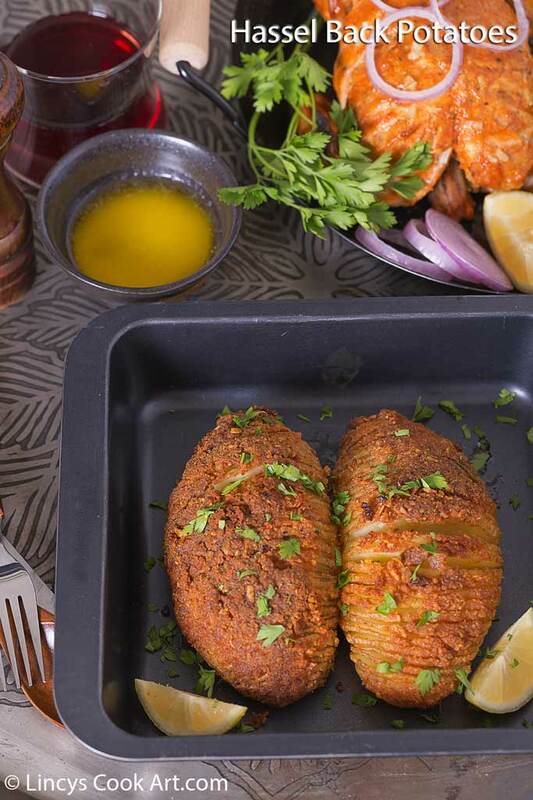 Hasselback Potatoes looks like a very fancy side dish, but is actually very easy to do. As it bakes, the slices fan out slightly for a show-stopping presentation. Preheat oven to 200°C for 10- 15 minutes. Oil a large shallow glass baking dish or line with aluminium foil. Rinse and scrub the potatoes thoroughly before using. Place two wooden chopsticks on each side of the potato lengthwise. Use a sharp knife and slice each potato crosswise, making 1/4-inch apart slices, cutting down vertically. The chopsticks will prevent the knife from cutting entirely through the potato. You need to leave 1/4-inch of the bottom of the potato intact. As you finish cutting each potato, drop them into cold water to prevent discoloring. Gently flex the potato fans open while rinsing under cold running water. This rids the potatoes of excess starch that can impede fanning. Dry potatoes well before baking. Place the Parmesan cheese, bread crumbs, 1 tablespoon melted butter, paprika, and salt in a blender jar; process until blended. Brush prepared potatoes with 2 tablespoons melted butter (making sure some gets in the potato cracks), and pat the prepared cheese/bread crumb mixture on top of each potato. Place potatoes in the oiled baking dish; cover with aluminum foil and bake 30 minutes. Remove the aluminum foil and bake an additional 20-30 minutes until they turn crispy and the flesh is soft. To serve, drizzle with remaining 2 tablespoons melted butter and sprinkle minced parsley over the tops of the baked potatoes. Note: You could add some chopped garlic when you melt the butter and drizzle with this garlic butter and salt and make the hassel back potatoes for the simpler easy version. Looks so delicious.. beautiful clicks.